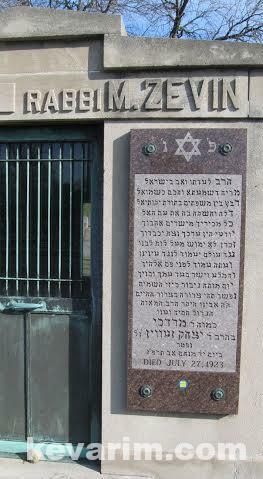 Directions to Kever: Waldheim Cemetery in Chicago maintains computerized records and will provided a detailed location map upon request. 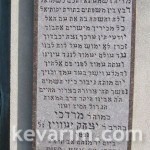 Was he related to the famed Rav S. Y. Zevin? 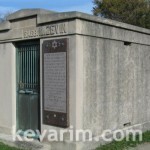 About his funeral here: http://www.findagrave.com/cgi-bin/fg.cgi?page=gr&GSln=Zevin&GSbyrel=in&GSdyrel=in&GSob=n&GRid=63557125&amp;. 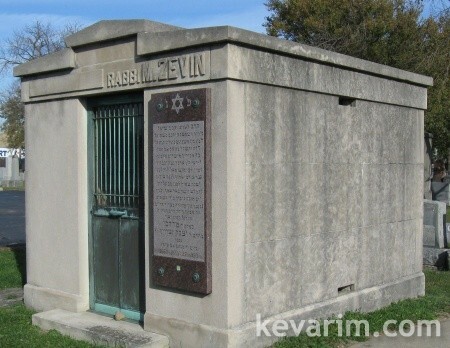 More than 10,000 persons yesterday attended the funeral services for Rabbi Mordecai Zevin, for twenty years rabbi of Anshe Libovitz synagogue, 15th street and Clifton Park avenue. The services were read three times by Rabbi Canton Kosnowski, also of Anshe Libovitz synagogue. 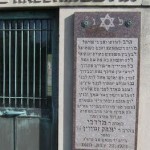 The first service was read at Rabbi Zevin’s own synagogue, the second at Kahalas Jacob synagogue, Douglas boulevard and Hamlin street, the third at Anshe Mairov synagogue, 13th street and Independence boulevard. 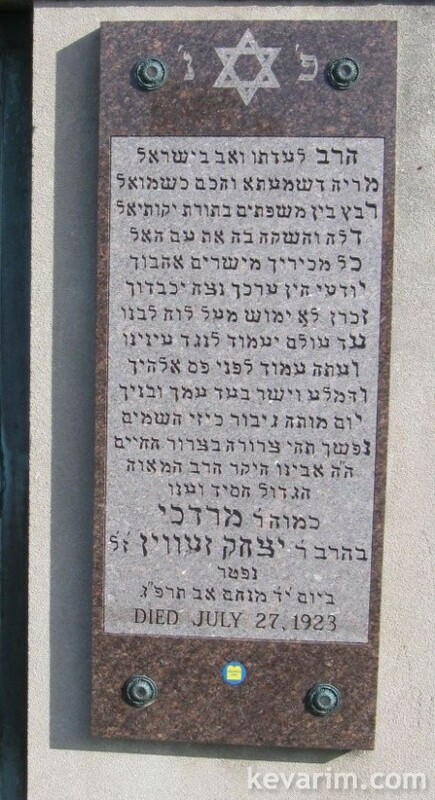 Rabbi Zevin’s body was carried on the shoulders of members of the various congregations from his home to the several synagogues, and at the last was put in a hearse and taken to Waldheim cemetery for burial. On account of the rules of the Livery Drivers’ Union, prohibiting the use of funeral carriages on Sunday, the procession was made up entirely of cars of friends and members of the congregations. The use of the hearse had been obtained through the intervention of The Tribune.